Thanks to everybody who sent in questions—which is none of you, because I never told you to send them in. So I made up some of my own, and answered them. This all has to be resolved by tonight, right? Yes, unless no. The rules say the Knicks have until midnight on the third day after receiving the Rockets' offer sheet for Lin. Usually, that's not an issue—the offer is FedExed or physically handed to a team rep, and the teams can count to three. But the Knicks have been trying to drag this out. First with bizarre hide-and-seek games in Las Vegas, where they literally deadbolted their hotel room door and sat quietly in the dark, hoping the Rockets rep in the hallway would go away. Now they're claiming the clock shouldn't start until the offer sheet was received at the Knicks' offices in New York, which would make the deadline tomorrow night. Why the stalling? The initial dodges in Vegas were to buy team to get the trade for Raymond Felton done, so the Knicks wouldn't be up against the wall. But now, this waiting until the last second, the rationale is anyone's guess. It could be the Knicks taking all the time they're allotted (and then some) to actually make their decision. Or it could just be gamesmanship. If they do end up matching Lin, the Rockets would be still need to find a point guard—and there aren't many left. Wouldn't all the Jeremy Lin merchandise sold easily cover the cost of signing him? The merchandise, no. The NBA shares merchandising revenue among all 30 teams. James Dolan will make about as much money for each Jeremy Lin Rockets jersey sold as he would for each Lin Knicks jersey sold. There's more than just jerseys, though. Linsanity was a boon for ratings, and road gates, and general fan interest in New York, America and Asia, all of which indirectly put money in Jim Dolan's pockets. (Attendance isn't an issue—the Knicks always sell out.) At the height of Linsanity, MSG's market cap rose the equivalent of $71 million. Yesterday, on news that Lin would probably not be returning, the market cap dropped by $49 million. Even that should be taken with a grain of salt, however. The market is notoriously reactionary—think a drunk guy or ESPN talking head declaring Lin the greatest point guard ever after a month of action. It's seen larger swings and corrections before Jeremy Lin ever signed with New York, and after his injury put him out of action. Still, there's no denying the Knicks with Jeremy Lin are more valuable than the Knicks with Raymond Felton. How much more valuable is something the front office has likely spent the last few days crunching. 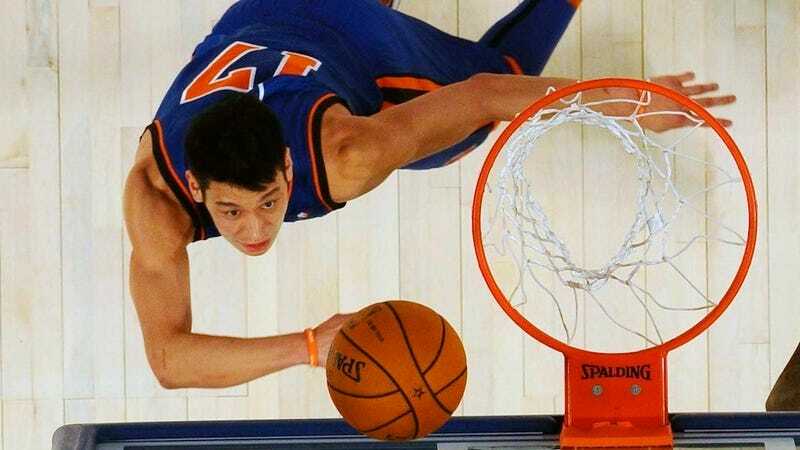 Why didn't the Knicks just give Lin a fair offer to begin with? They couldn't. As a player with Early Bird rights, his current team was only allowed to offer a first year at the league average—around $5 million—and raises of just 7.5 percent each year after that. The Rockets could give him whatever they wanted, and the Knicks could match that, but New York didn't have any choice but to wait for him to sign an offer sheet. Are there ways the Knicks can match Lin's deal, but trade him before the "poison pill" third year? Yes, but it won't be so easy. In 2014, Jeremy Lin's expiring contract would be pretty appealing. But presumably the Knicks wouldn't want to take on comparable salary in return, since they'd be over the luxury tax threshold already. So, draft picks—which wouldn't be too shabby. They would also receive a trade exception (unless Lin is moved along with another player), which would give them one calendar year to add the equivalent of Lin's salary—but that could only be used in future trades, not in the free agent summer of 2015. It would be even more complicated if Jeremy Lin is still a star in two years. The Knicks could be hard-pressed to find a team willing to take him on in the last year of his deal without assurances he'll stick around. But the Knicks, as a luxury taxpaying team, won't be able to do sign-and-trades—meaning any team that trades for Lin will be getting an expensive rental. There is a second option for the Knicks, and it's not attractive, but it might be an emergency exit. The little-known Stretch Provision was added to the latest CBA, and it would allow the Knicks to waive Lin before the third year of his contract. The $15 million owed him would count against the Knicks cap over three years—$5 million in dead cap space each season. It's not ideal, but if the luxury tax is such an issue, it's one of the few ways around it. As of press time, more than 11,000 people have signed a petition asking the Knicks to match Houston's offer. That's nice. Now if each of those people also wrote a $4,000 check to MSG, they'd cover the cost of signing him.